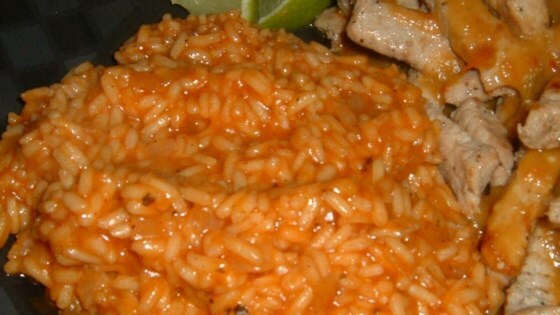 "A very simple tomato Mexican rice recipe. I can have this in the oven and cooking in one set of ads on the TV. If you don't have chicken stock, use hot water and chicken bouillon." Heat the oil in a large skillet over medium heat. Add the onion and garlic; cook and stir until onion is translucent. Stir in the chili powder and cumin, and cook for about 30 seconds. Add the rice, chicken broth and tomato paste, and bring to a boil. Transfer to a 1 quart casserole dish, and cover with aluminum foil or a lid. Bake for 35 to 40 minutes, or until liquid has been absorbed and rice is tender. Let rest for 3 to 5 minutes before serving. Substitute tomato sauce for the paste. I thought this was great! I used brown rice and tomato sauce and just baked it a little longer. Great texture and taste. good simple/ basic rice recipe. I added diced tomatoes and green pepper & onion to doctor it up a bit. I cooked this at in my cast iron skillet to avoid having to wash two dishes. I live at 9300 feet, and despite the altitude it came out FANTASTIC. :) I used saffron instead of chili powder.